Saturday January 24th 1925 I read Iowa City papers in the forenoon. They tell of Newton Portains death. I wrote Ida after dinner and took the letter to the office expecting to go to a matinee. But company were delayed so I went to a picture show. The evening at home with Mrs Carl. 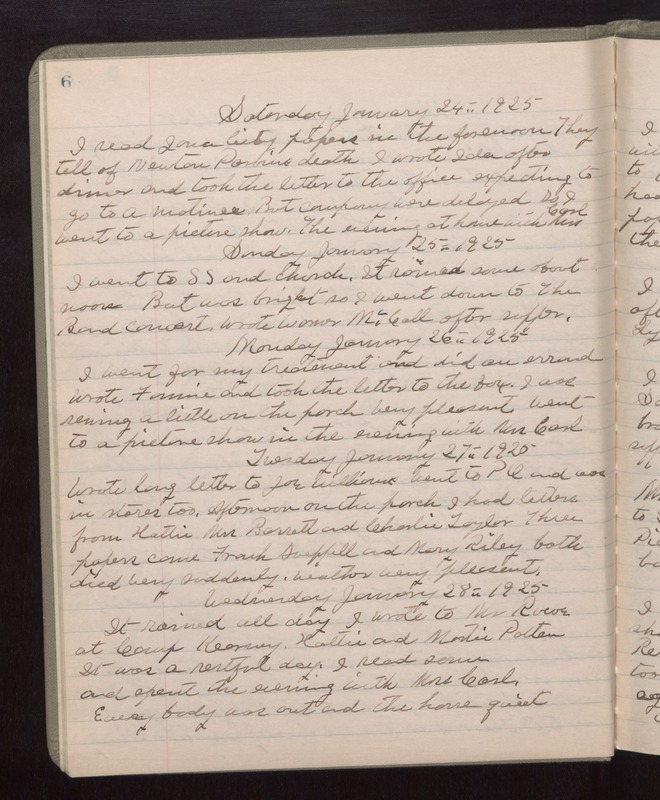 Sunday January 25th 1925 I went to SS and church. It rained some about noon But was bright so I went down to the Band concert, wrote Warner McCall after supper. Monday January 26th 1925 I went for my treatment and did an errand. Wrote Fannie and took the letter to the box. I was sewing a little on the porch. Very pleasant. Went to a picture show in the evening with Mrs Carl. Tuesday January 27th 1925 Wrote long letter to Joe Williams. Went to PO and was in stores too. Afternoon on the porch. I had letters from Hattie, Mrs Barrett and Charlie Taylor. Three papers came. Frank Sueppell and Mary Riley both died very suddenly. Weather very pleasant. Wednesday January 28th 1925 It rained all day. I wrote to Mrs Rowe at Camp Kearney, Hattie and Martie Patten. It was a restful day. I read some and spent the evening with Mrs Carl. Every body was out and the house quiet.